Wednesday Fish Fry! That’s one thing I remember most about my childhood (that and hush puppies). While many remember fish fry Friday, my family did ours on Wednesdays. I always loved a good ole’ fish fry. We had them at my family reunions growing up, and they were a blast. I still remember being outside in the Mississippi summer heat watching the elders fry catfish and hush puppies while soul music jammed in the background. We still have an annual fish fry at my grandparents’ house the day after Thanksgiving and growing up we had them on Wednesdays, my dad’s day off. Ya see, fried fish is my dad’s favorite food period. I grew up not only having fish on Wednesdays but whenever my dad could sneak it into the weekly menu without us begging for an alternative. Whenever we head down to Mississippi, we always return with a massive box of fresh catfish from down in the Delta. And what goes better with a bunch of fried hot catfish fillets than southern hush puppies? That’s right! Good ole fashioned hush puppies are to fried fish what peanut butter is to jelly. 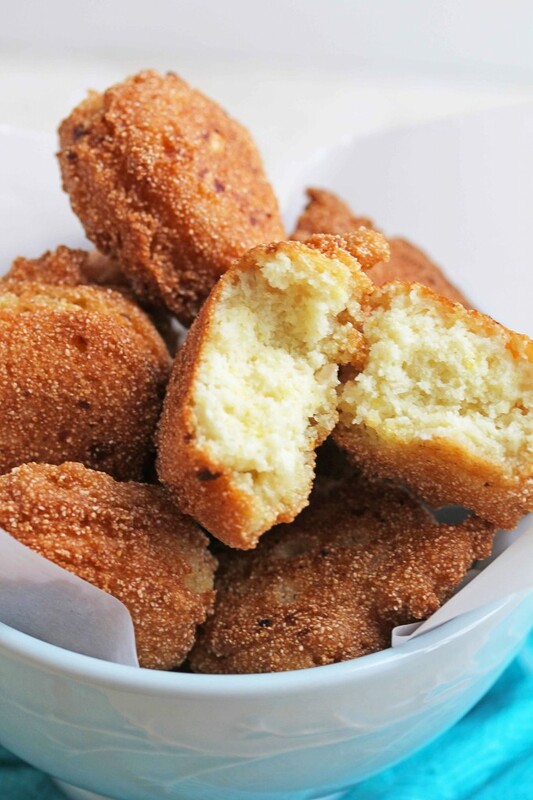 This is the perfect hush puppy recipe too because they taste like little morsels of fried cornbread. Sounds utterly delicious right? I whip up the batter for these in about 5 minutes flat, fry them up golden brown and serve them along side some fried catfish, tilapia, perch, flounder, whiting, shrimp or whatever else we may have in the house. It reminds me of home and those good times at our Fish Fry Wednesdays. What meal days do you remember most from your childhood? Good ole fashioned hush puppies are to fried fish what peanut butter is to jelly. 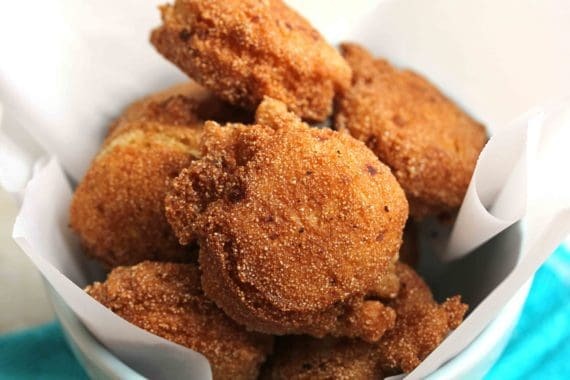 This is the perfect hush puppy recipe too because they taste like little morsels of fried cornbread. Sounds utterly delicious right? I whip up the batter for these in about 5 minutes flat, fry them up golden brown and serve them along side some fried catfish, tilapia, perch, flounder, whiting, shrimp or whatever else we may have in the house. In a skillet, add frying oil and heat. In a medium sized bowl, add corn meal, all-purpose flour, baking powder, salt and granulated sugar and whisk together to combine. Next add in egg, onion and milk and whisk until batter is thick and well combined. Over hot heat, drop in tablespoons of batter and fry until golden brown on all sides. 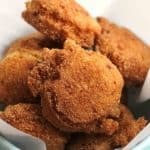 Remove hush puppies once golden brown and drain on paper towels. Serve hot. I normally deep fry my hush puppies but I’m going to try it this way. Yes, I do either way depending on convenience. My mother in law makes the BEST hush puppies for fish fries during Lent. Looking forward to visiting her church in the next few weeks to get my fix. NICE!!! Hush Puppies are the best! Now you’re singing my song. I grew up going to Mississippi catfish houses and hushpuppies were always front and center. Brings back so many memories. Great post, Jocelyn! Oh gosh I know this is like second nature to you Bill! Yum!! Funny enough in Jamaica they have a Fish Fry Friday, every Friday…! 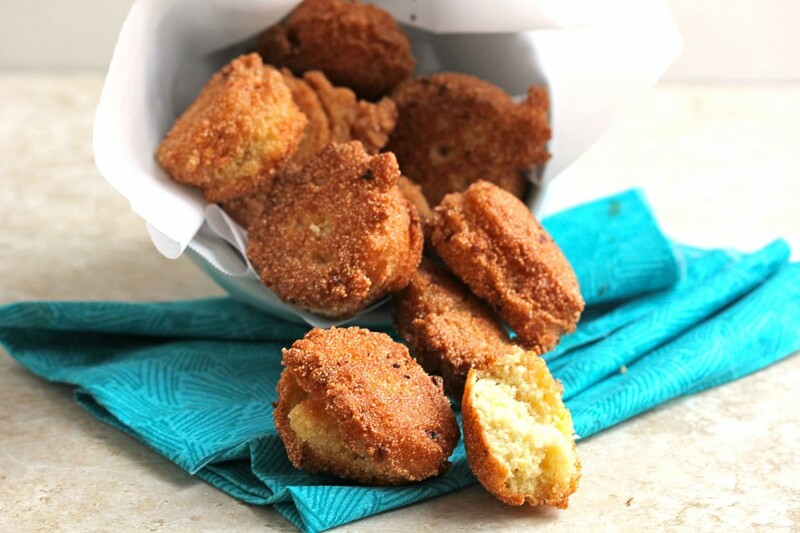 I’m a fan of fried fish from the beach specifically, but I totally love all hush puppies! Oh gosh Jessica! That sounds amazing. I wish I could experience the Jamaica fish fry!! Joceyln, those are gorgeous! I tried making hush-puppies once with disastrous results. I’m going to try your recipe next time. I can practically taste them!! Yum Maria!!! I think I can taste them too!! Dude, seriously, I wished you lived next door! These look wonderful. We need to arrange living next door to each other girl! I don’t think I have ever had hush puppies before but they look delicious! They are pretty yummy Julianne! You have to try them one day! We would have definitely invited you over to our house!! Absolutely Erika! That honey butter idea sounds amazing! Oh wow, you used to have the traditional Friday fish fry too? Awesome! 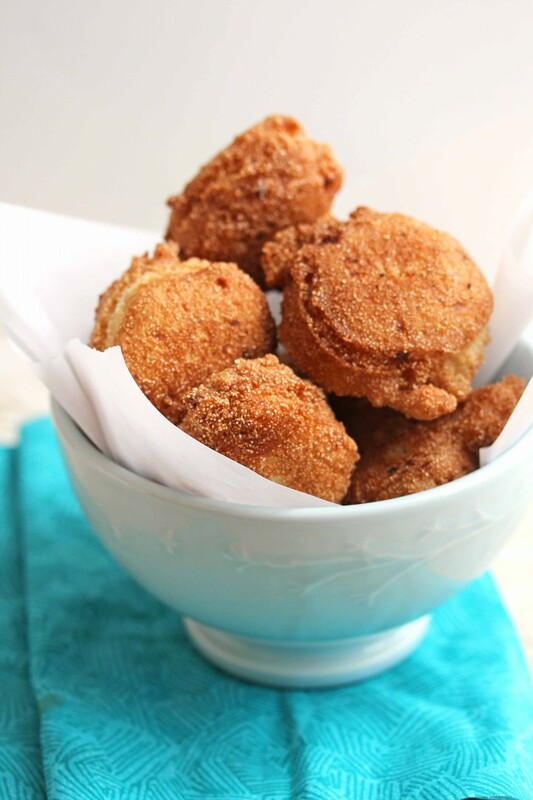 Gosh I thought I was the only one that thought hush puppies were a guilty pleasure!! These look amazing Jocelyn! I’ve never had a Hush Puppy…might need to change that! I know right?? Same here! I grew up eating hush puppies and have not made them in a while. Thanks for the recipe! I love that you grew up eating them! That is so cool Melissa! Definitely on the same tip! Love hush puppies, especially when they come with a good sauce. Growing up in the South, hush puppies and fried fish were the best combo. Yes fried fish and hush puppies are the best combo ever! All I need is some catfish. These are the perfect, golden brown! Fish fry weds sounds like a spectacular dinner to look forward to every week, and this side dish looks heavenly. Yes those are exactly how they taste too Ashley! These kind of recipes always remind me of my dad, too! He sure isn’t Southern, but he likes his fish fried. 🙂 They look amazing, Jocelyn! We have similar daddies it seems!! Jocelyn, these looks so good! I have to admit that I am not much of a fan of fish [though I keep trying! ], but hunks cornbread fried in oil? Huge fan of that! Yep that’s the thing that is so awesome about hush puppies, they can easily stand alone! Wow – these look absolutely delish. Fried perfection! I’ve never had these, but must change that soon!! I love hushpuppies even thought I’m not a big fish fan. These look amazing! I loved pizza night at our house. Since we always got to help with the assembly 🙂 Thanks for sharing. Pizza night is so awesome too! I do that now in my house!